As we go through the essential transition to declining energy, the limited and erratic nature of renewable energies provides a valuable negative feedback, reminding us that all natural resources must be used carefully and respectfully. These photos were taken today in our backyard. How many uses of the sun can you identify? Which uses do you think best optimize the sun’s energy? This season we are focusing our efforts more on rebuilding the soil, reshaping the garden beds (and by “we” I mean mostly head gardener Angela), and redesigning our landscape with swales, rather than an emphasis on food production. Hence the cover crop of buckwheat on these newly shaped garden beds. And speaking of the sun’s power (amplified by the human caused greenhouse effect, i.e. climate change)…fellow blogger Robert Scribbler has a couple of worrying posts on the current heat wave being experienced on the west coast and it’s affect on Arctic Sea ice. See “Mangled Jet Stream and Global Warming to Shatter Earth’s Highest Recorded Temperature This Week? and With ‘Warm Storm’ at Its Heart and Heatwaves Rushing in From The Sides, Arctic Sea Ice Braces for Major Blow . In more positive news (also related to the topic of this post), Robert’s latest post is about Renewables to Replace Nat Gas as World’s Second Largest Electricity Source by 2016, Generate 25% by 2018. To harvest, store and use renewable energy sources requires varying inputs of high-quality (generally non-renewable) energy…In the case of wind power, the lower quality and erratic nature of the energy resource requires the much greater harvesting infrastructure. For solar electric power, the resource is most abundant but so low in quality that vast infrastructure is required relative to the quantity of harvested energy. Despite these limitations, solar (photovoltaic) cells that convert sunlight to electricity have become the great symbol of renewable energy, out of all proportion in importance to a future with declining energy…I believe that a high-tech society running on solar cells is the stuff of dreams. I am glad to have solar panels, but I don’t see them as a panacea, and I believe the jury is still out on how much net energy they generate after accounting for the varying inputs required for their manufacture (see here (check comments) and here for an alternate view). Why did I not put the wet clothes in our very efficient clothes dryer inside the house, and let the energy from the panels dry the clothes? 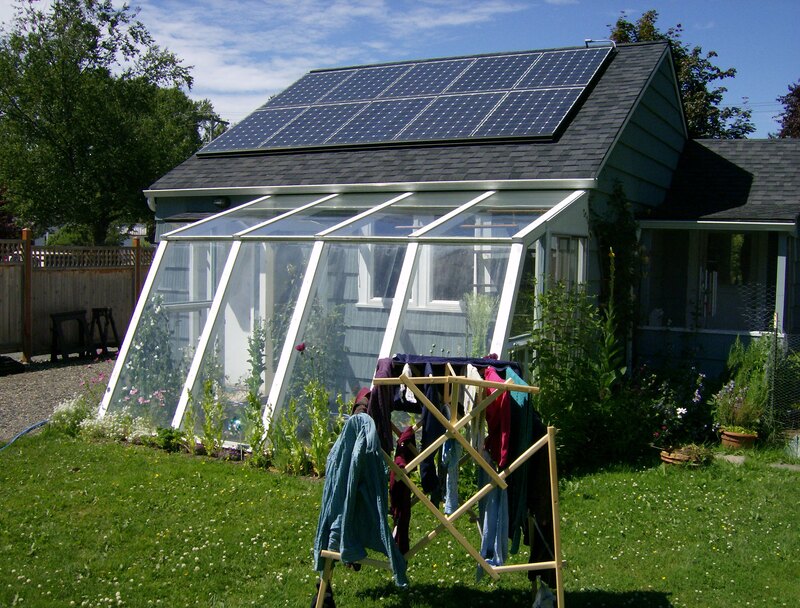 Because using the direct energy of the solar clothes rack is much more efficient (when the sun is shining). I asked at the top of the post, “Which uses [of the sun shown in the photos] do you think best optimize the sun’s energy?” The answer is likely the trees in the background, and the grass and garden beds in the foreground. Studies in biophysics providing curves of efficiency as a function of light intensity for isolated [green plant] cholorplasts show them to be more efficient than hardware cells. It may be that the natural conversion of sunlight to electric charge that occurs in all green plant photosynthesis after 1 billion years of natural selection may already be the highest net EMERGY [embodied energy] possible. The ultimate development of the biological capture and storage of solar energy in forms useful to future generations of people is forest trees. Although trees do not yield electricity directly, they do most efficiently convert the very dilute solar energy into wood that we can more effectively substitute for many current uses of fossil fuel. For example, modern technology for wood gasifiers and micro-gas turbines appears to be a much more economical pathway for electricity production than solar cells. 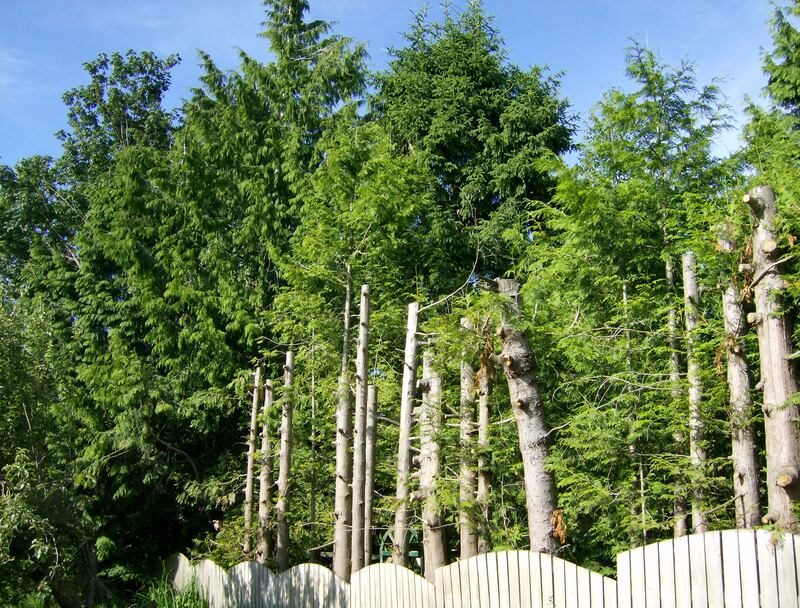 Our neighbor carefully cultivates and harvests evergreen trees on his 1/2 acre plot next door (picture above). I’m not sure of the efficiency of his wood burning stove, but I believe he is making very good use of solar energy. We should also note the intermediate technology of the greenhouse in the picture at top, especially since we used reclaimed glass rather than new. According to Holmgren, when you make use of another’s discarded materials, this should be classified under the Permaculture principle of “Obtain a Yield” (rather than “Produce no Waste“). There are still at least a couple more uses or potential uses of the sun’s energy in the pictures up top that I haven’t discussed here. Can you name them? The developing environmental orthodoxy is that we must increasingly separate all human support systems and ourselves from nature in order to prevent damage. This is a delusion created by generations of urban affluence separated from the cycles of nature. Although there are many positive and useful examples of environmental technology based on natural models, the underlying principles of separation of people from nature are philosophically and energetically flawed. We need to recognise that sustainable systems are more likely to emerge from an intimate parnership with nature, rather than application of natural design principles within the confines of the technosphere. Thus the slogan “nature knows best” is appropriate. First we’d like to thank those who participated last weekend in our swale making event. Thanks to Brian Kerkvliet who taught us and led us every step of the way. He did so with an easy going attitude and a passion for this work that he loves to do as well as a fantastic amount of knowledge. Thanks to Larry who operated the excavator. Janaki and Kevin participated from beginning to end, learning and working on every aspect of the project. Special thanks to Janaki for bringing delicious dessert and a box of starts for the finished swales. Thanks to Andrew and Naomi for joining us on Saturday and getting their hands in the dirt as we sculpted the swales. Thanks to Celt who swooped in near the end with some much needed landscape fabric. Thanks to our lovely hens who stood by patiently while we made a lot of noise which they aren’t used to. And thanks to our beloved Kitty who gave up her usual run of the house so we could tromp in and out. And thanks to the land that supports us. 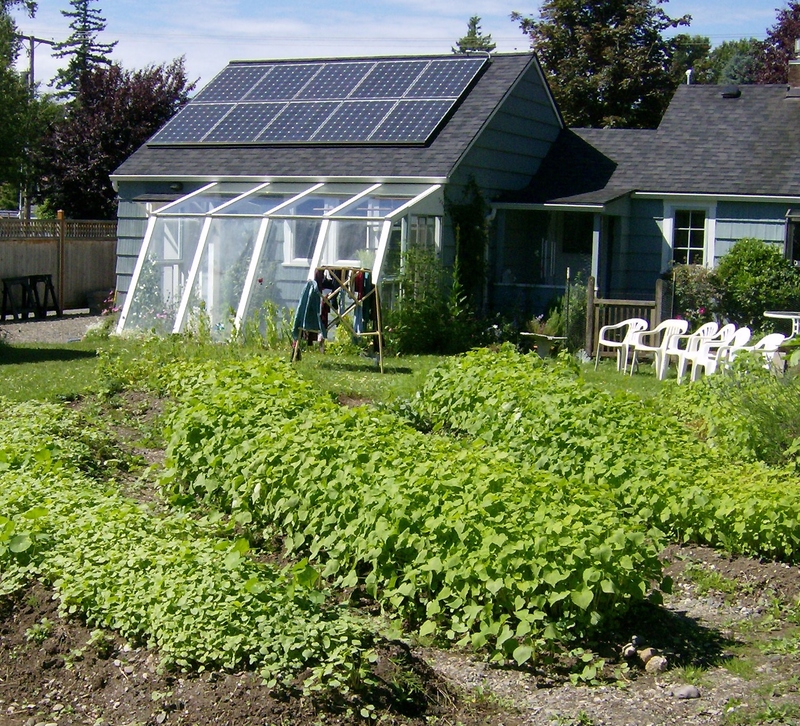 It’s always helpful to refer to some visual aids and Permaculture design principles. Janaki and Kevin use the A frame to find and mark the level path of the contour. Janaki sets a stake. The spill way between the upper swale and the lower swale is roughed out. It’s on the left. That will also need to be refined and some additional shaping to slow and spread the water flow in the super rainy seasons. Here’s a final shot of one swale, We added a board over it to make a way to run a wheel barrow across. Later we will decide if we want to build a little bridge or use a culvert and a raised path over the top. This coming Sunday we will have another work party and learning event starting at 9 am. We’ll be finishing the sink holes by adding a liner and large gravel. We’ll need help hauling gravel with wheel barrows and doing some finishing work shaping the swales. Angela will be making a lunch for everyone. And Brian will be giving an overview of swales and the design process. It will be a great opportunity to see swales in the making and to hear Brian share his wealth of knowledge. Plus it will be fun. Lets hope the weather will be conducive. In spreading the word about our swale making event, I sent the announcement to a number of people and organizations we thought might be interested in attending. From one of those people we received back a reply – from Eli Mackiewicz, Engineering Technician,City of Bellingham Public Works Department. In his letter Eli, expressed concern about how the earth moving aspect of making swales could impact environment and neighbors, and whether or not we are aware of city and state regulations for such activities. Eli brought up some important points, and was very friendly about it, but also seemed to not understand very well the purpose and strategy of swales (which I tried to briefly explain in my reply). In our workshop, Brian Kerkvliet pointed out that sometimes the Public Works strategy of “rain gardens” is perhaps not as robust as it could be. Might it help if public works engineers were trained in permaculture? First, I would be very careful that you aren’t digging these swales in a wetland or wetland buffer. If you gave me the address, I could search for any known wetlands we have in our inventory. Disturbance of a wetland is a very serious action and is generally heavily regulated. Plus, digging swales in a wetland could be worse for the environment and water quality. The City, State, and Army Corps of Engineers has the right to order you to reverse any work you do that harms a wetland, even if the work – or its impact – isn’t discovered for many years after you’ve done it. Secondly, you have to be careful that your swales don’t push water onto your neighbors’ property. Although the City does not regulate this activity, State Law expressly prohibits new projects taking water from your property and dumping onto your neighbor, and if they complained about your work they would likely win in court. Just a head’s up. Finally, earthwork (digging swales, grading, clearing) in excess of 500 square feet within the City requires a stormwater permit and inspection. I don’t know if you’ve submitted for a permit or not, and I can’t make you do it, but if a neighbor calls or an inspector comes across the work you would be shut down and fined. This has been the law since 1998. All earthwork requires erosion and sediment controls to prevent the exposed soil from being washed away during a rain storm. I understand that you have good intentions, but intentions are not considered in the permitting process, only the facts. To protect our water resources, we have to ensure that all work is held to the most environmentally-protective standards, which are very stringent in Bellingham. I hope you understand the purpose. Please don’t hesitate to let me know if you need references or resources for any of the above. Thank you for your reply and sharing your concerns about compliance with city and state regulations, as well as care for environment and water quality. We are not in a wetland area (I checked the city map of wetlands and made sure). The swales will be installed near the highest elevations on our property. It does not collect water there like a pond, or swamp, or wetland, but because it does not drain well, it is not dry enough in spring to plant a garden where we would like. The swales are being designed to catch, store, sink, and spread the water on our own property – to put it to best use, rather than finding ways to drain it off or shunt it onto neighbors property. These are NOT ditches designed to divert water. Two consultants have provided the opinion that a significant part of the excess water on our property now is due to runoff from neighbors to either side, where they have several large buildings with downspouts going right onto the ground and heading our way, as well as possibly from a neighbor’s fountain that may be leaking. Our swales will be dug on contour to hold the water, and the soil we dig up will be used to make a berm to absorb the water from the swales. The berms will be planted with mostly edible plants to take up that water. So we’ll have raised garden beds, and reduced need for using city water. Spillways will be created to direct excess water to the next swale, with the final balance directed to the low spot on the property where the water naturally runs. Our swales (likely 2, but 3 max) will be small and shallow – gentle curves appropriate for an urban property, and definitely less than 500 sq. feet. Thank you again for taking the time to reply. It was good to get your feedback, and I hope I have assuaged your concerns. Thank you for the well-reasoned response and your protective approach to this project. I wish you nothing but the best of luck in your efforts. As someone whose job it is to help homeowners in the Lake Whatcom Watershed do voluntary projects for stormwater and nutrient management, I have seen great projects go sideways due simply to a lack of forethought (sometimes on my part, too). It sounds like you have it all under control and have taken into consideration all of the appropriate planning steps. I applaud your effort, which is above and beyond the typical homeowner-level approach – although with your training, it looks like you’re trying to raise that bar. Good on you. If you are working with a consultant, landscape designer, or contractor who has not yet heard of the opportunities to get involved with our pool of motivated homeowners, please feel free to pass my information along. Information about the program I administer, the Homeowner Incentive Program (HIP), can be found on the City’s website, here. Regarding your neighbors’ drainage, the best hope I can offer is that City Code will require them to manage that runoff when/if the roof is replaced (replacement means structure and shingles, not just shingles) – as long as they do the right thing and get a permit. That, I cannot guarantee, of course. Our code allows “historical” drainage systems (which were originally designed in ye olden days when we treated rainwater like a waste product instead of a resource) to stay in place as long as they are not modified. Modern, low-impact systems are much more thoughtfully designed to both manage runoff and reuse rainwater for beneficial purposes. Perhaps your effort will be the impetus that motivates your neighbors to bring their drainage system up to 21st century standards. If you need help on your project, be it a confirmation of something you’re pretty sure is right or a request for information about a new or emerging strategy which you know nothing about, please don’t hesitate to call or email me anytime. While I can only supply financial assistance for Lake Whatcom Watershed homeowners, I can provide technical assistance to any City resident, at their request. Good luck on your project and the training. You can tell all of your participants the same thing I told you about free technical assistance being available – even if they don’t live in the City proper. Thanks again for your thoughtful reply to my initial email. The ‘A’ frame is designed to help determine the most level points between the two legs. It is used to map contour lines – a level line across your property. Brian K. used the elevation map to roughly design the swales, and we will use the A-Frame to more precicely mark them out. It is important to make the swales on contour to hold and store more water and the resources that water carries. The contour line is needed because if your swale and berm is on contour you will hold the water much more effectively. 5. Keep going until you have marked the area that you need for your swale. Using the map of the elevation lines on the property to roughly gauge where the contours are, David used the A frame to plot the course of contour lines across the property where we plan to carve the swales. Next, putting a stake in to mark that spot…. And it always helps to have a nice kitty doing rollie-zollies in the grass nearby. Using the A frame to map out contour lines on the land. 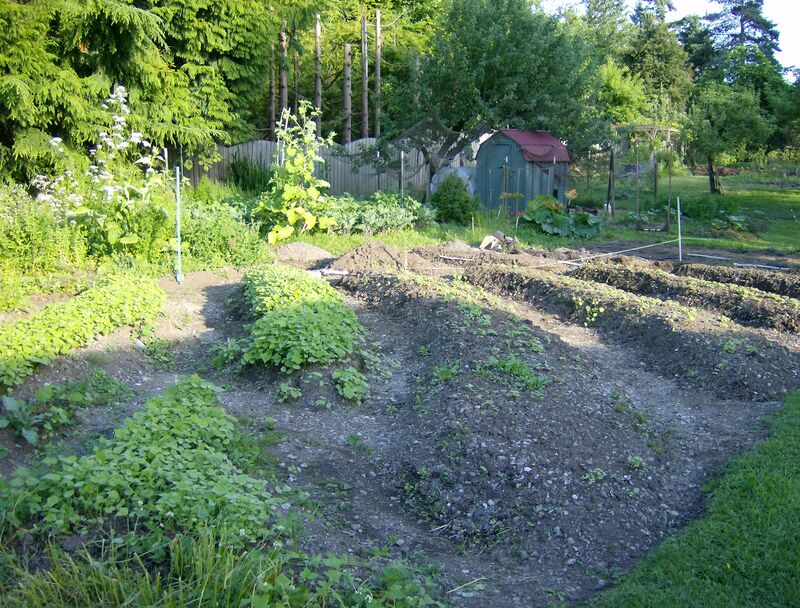 Now for the existing garden beds…..In a shadier location, but with much dryer soil. This would be a good place grow greens. But those boxy linear beds have to go. I’ve thought about this for 3 years and used the beds as is. While there are some advantages with raised beds in wood frames, these beds where not very high and really restricted movement. All the landscape fabric suffocates soil life. And the treated wood….treated with stuff I don’t want in the soil anyway. There were 10 of these beds each about 18 feet long and 3 feet wide. The paths all around the beds have gravel and landscape fabric about 6 to 8 inches down. The beds were framed with treated wood and black plastic. I got all the treated wood out last fall. I’m in the middle of taking out the landscape fabric. The next step for getting ready to create swales was to find an aerial map of our property. We found the most current one taken just before we bought the place in 2010. The photo shows where buildings and trees are located, and a map making friend added contour lines (thanks Stefan!). And finally Brian sketched on the map where the swales will be located, combining the aerial photo, the contour lines (in magenta) and the sketch of the possible swales (brown and blue). Nice job Brian! Our plan is to focus on creating the top two or three swales that are outlined on the map. That’s where it’s the wettest and also the sunniest. Probably not put a pond in at this time. Creating an ‘A’ frame with a plumb bob to stake out the high points of the contour lines.